Before you start posting a for sale ad, start with the basics first–decluttering. You wouldn’t want to move to another state and keep on driving back and forth to get furniture or memorabilia. 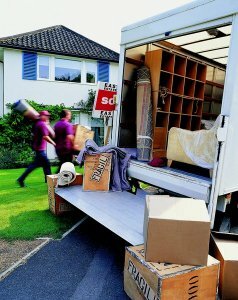 If you are moving, you may want to stick to the bare necessities. Sort out important items that you need in your new place and store those that you may find valuable in the future. Toss or sell other stuff that is no longer valuable. Taxes can be too burdensome so make sure you consult with an expert such as an accountant or tax attorney. They will be able to assist you in understanding what needs to be paid, how much will be paid, etc. Having a point of contact who can help you watch over your home while you are out of state is also a convenient option to make sure that your buyers can access your property. Choose someone you can trust–a family member, a friend or a neighbor who is willing to give a helping hand. You may leave a key to your contact person and have them utilize a lockbox. Marketing is especially important if you are selling a home from out of state. There are a number of marketing tools that are readily available for free or for a fee such as social media, newspaper ads, and/or website listings. It is important to note though that in marketing, you need to be creative for your ad to be noticed. Selling a home from out of state is no doubt challenging, especially if you need to sell fast. The good news is, there’s always an investor looking to buy more properties. Investors can close in as fast as 30 days or less. And what’s more, you get the amount you ask for since you won’t have to pay an agent and the closing fee. Investors like Big House Investors LLC can provide a fast cash for your home so you can avoid the hassle of selling your property from out of state. You can trust that your home is well taken care of. The Big House Investors Team will help watch your home, lock it and make sure that it’s safe, help you move furniture, clean out the property, cut the lawn, remove trash or debris, etc. Closing can be done remotely and the whole transaction is handled by an attorney. So even if you are out of state or outside the country, you can still sell your Atlanta property to Big House Investors. All documents can be electronically mailed for you to sign, and closing can be done even if you are not physically there.